My two German Shepherd Dogs River and Forest love water. They love playing in it, diving into it and, of course, drinking it. Out of all the quirky dog obsessions, water is probably the best one. Have you ever wondered how dogs drink water, though? The answer is anything but simple. A closeup of a dog drinking water. Photography ©Chalabala | Thinkstock. On the surface, how dogs drink water seems pretty basic: Dogs drink water by lapping it up with their tongues. However, what seems simple for dogs would be nearly impossible for us to do. So how does a dog’s tongue get water from his mouth to his throat? It’s a question that took researchers a long time to answer. It was worth the wait, though: What they found is fascinating, too. Saddle up, folks: Let’s talk about the amazing science behind how dogs drink water. Look at your dog. Look at yourself. There’s one thing that we have but dogs really don’t have that helps with drinking water. Do you know what it is? Of course, that poses a different question: How does lapping work? So, what’s a water column? It’s literally the water that splashes up if you were to plunge your hand in and out of a bowl of water rapidly. If you try this yourself (it’s fun! ), you will see the water shooting up and down in a column-like shape. That’s what your dog is biting down on when he drinks. Figuring that out wasn’t easy. Scientists were stumped by something else dogs did when they plunged their tongues into water: They curled their tongues backward while doing it. Their tongues looked like ladles, and it made scientists wonder if dogs were scooping water into their mouths. There you have it: How dogs drink water is scientific genius. So Why Are Dogs So Messy With Water? Science is great and all, but does it explain why dogs are so messy when it comes to drinking water? Actually it does, Jung says, hinting that dogs sort of do it on purpose. When they create water columns, they’re trying to create the biggest ones they can. To do that, they more or less smash their tongues into the water to create big water columns, which result in big messes. How Much Water Do Dogs Need? Now that you know how your dog drinks water, the next question becomes how much water does a dog need to drink a day? It all depends on your dog’s size. According to the article How Much Water Should a Dog Drink a Day?, “a healthy dog drinks about ½ to 1 ounce of water per pound of bodyweight per day.” So, if you have a 50-pound dog, you’re looking at 50 ounces a day, or a little over 6 cups. Does that mean you need to measure out a certain amount of water a day? Not exactly. How much water your dog drinks also depends on his activity level, diet and even the weather. If your dog is active or it’s hot outside, expect him to drink more water. For that reason, most experts recommend having fresh water available for your dog at all times. Can Dogs Drink Too Much Water? Too Little Water? Of course, the problem with having a water bowl out at all times is that it’s hard to tell if your dog is drinking too much or too little water. Either can be a sign that something is wrong with your dog. If you think your dog is drinking too much water, try to rule out factors that might be contributing to it, such as exercise, hot water or dry food. If that doesn’t explain it, then a dog drinking an excessive amount of water might signal something serious. It could be kidney disease, diabetes mellitus or Cushing’s disease. Get your dog to a veterinarian immediately to rule out any health issues. Sometimes, a dog just accidentally drinks too much water, either when playing in it or swimming. This is known as water intoxication, which is also potentially life-threatening. Most dogs will throw up the excess water, and you should keep them from drinking too much again. Not sure if your dog drank too much water? Look for signs of water intoxication, such nausea, vomiting, lethargy and abdominal distention, according to the ASPCA Animal Poison Control Center. In more serious cases, your dog may have a seizure or slip into a coma. If you see any of these signs, get your dog to a veterinarian immediately. Similarly, your dog drinking too little water can signal a problem, too. Try to rule out reasons why first; for example, if the weather is cooler or your dog is exercising less. If that’s not the case, it can be sign of illness or disease. If you notice any of these signs, it’s time for a trip to the veterinarian. Thumbnail: Photography ©K_Thalhofer | Thinkstock. Jessica Pineda is a freelance writer who lives in Northern California with her two German Shepherds, Forest and River. Check out her dogs’ Instagram page at @gsd_riverandforest. What Type of Water Alternatives Can Dogs Have? 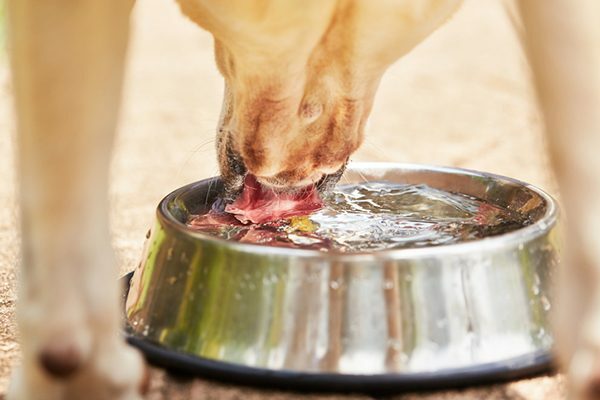 The post How Dogs Drink Water Is Anything But Normal appeared first on Dogster.